Now that we have confirmation that the Liberator 3D-printed pistol can be fired without destroying the body, let’s address what this means for 3D printed weapons and, presumably, homemade weapons in general. Does the pistol work? Yes, it can be fired at least once without damage to the body of the gun or the person at the trigger. Andy Greenberg at Forbes has seen the gun fire multiple times and the video above shows one shot. Is it a real pistol? No. This is more of a zip gun than a pistol. Zip guns were improvised firearms made of tubes, rubber bands, and nails. Kids fool-hardy enough to shoot one (this cohort included my own father who showed me how to make them) were promised a second of hair-raising and potentially deadly excitement when they made zip guns out of pipe and rubber. To fire one, you fitted the cartridge into the pipe and pulled back on the nail attached to the rubber band. If it hit the charger properly the bullet would fire. A similar thing is happening here: a spring-loaded nail is hitting a cartridge. The barrel of the gun is threaded but I wouldn’t expect this weapon to be very accurate. Think of this gun as a controlled explosion generator. It uses a very small .380 caliber bullet which is deadly, to be sure, but quite small. Could I print one? Yes. You can easily download the 3D-printable files from DEFCAD.org (here is a torrent) and if you have a 3D printer you can easily print any of these parts. The creators built this gun using the Stratasys Dimension SST 3D printer, a high-resolution printer that works similarly to the Makerbot but offers a far finer and more durable print. This printer has a layer thickness of .25mm, which the Makerbot can easily match. 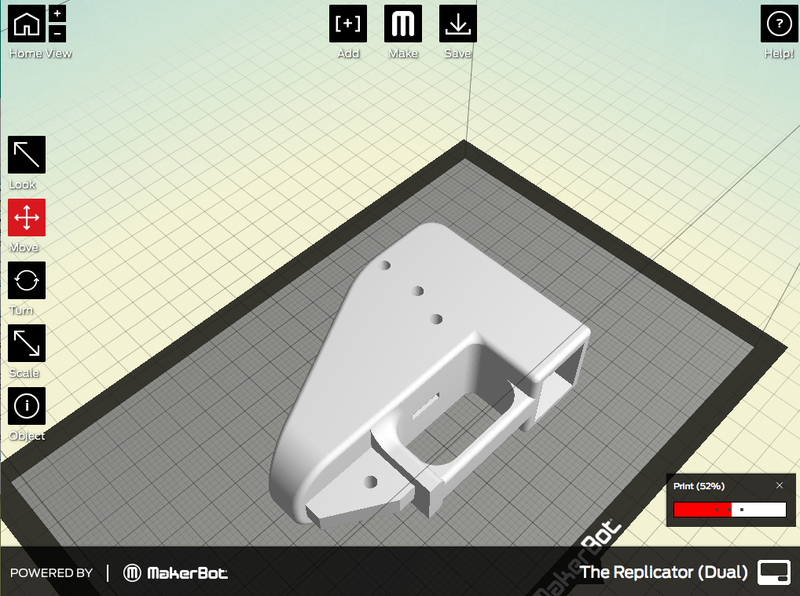 Would I print and fire this using on my Replicator? No. I’m far too risk averse. I asked multiple 3D home printer manufactures and none would comment specifically on firearms, so there is no implicit or explicit promise of safety. Will someone try to print it on home equipment? Yes. Is this legal? Yes, but I’m no lawyer. It is a legal, homemade firearm and those have been made in basement workshops for most of this century. In most cases, a Federal Firearms License is mandatory to begin making or manufacturing weapons. For example, anyone building this gun would be a “Manufacturer of Destructive Devices, Ammunition for Destructive Devices or Armor Piercing Ammunition.” Anyone can apply for this license, thereby making the manufacture of this thing legal. For decades, however, the need to license was a minor barrier to entry into what would be a non-trivial process. The tools and materials necessary to build a real gun in your basement were expensive and it made economic sense to legally safeguard your home workshop. The manufacture of a 3D-printed weapon, however, is trivial, and can be built by anyone with an investment of $8,000 or so for a Stratasys printer or, for the less risk-averse, a home 3D printer that costs about $2,000. Thus, you can legally print ONLY the frame entirely in plastic, even without 3.7 ounces of steel.-Once the frame is finished, epoxy a 1.19×1.19×0.99″ block of steel in the 1.2×1.2×1.0″ hole in front of the trigger guard. Add the bottom cover over the metal if you don’t want it to show.-Once the epoxy has tried, the steel is no longer removable, and is an integral part of the frame. Now your gun has ~6 ounces of steel and is thus considered a ‘detectable’ firearm. So now you can print all the other parts. It is, in short, legal to make a gun and this is a gun. Can this be stopped? No. A cynic would also say that the entire Defense Distributed agenda is an example of trolling that will eventually do more harm than good. The cynic would also say that a harsh government crackdown would also be equally silly. A nuanced approach is absolutely necessary. The non-cynical would find this to be more a proof of concept than a real manufactured weapon and say that it was bound to happen eventually. 3D printing has made manufacturing trivial. This is a logical evolution of an entrenched industry and a centuries-old product. Gunsmithing is not a new hobby. However, it just got much easier.